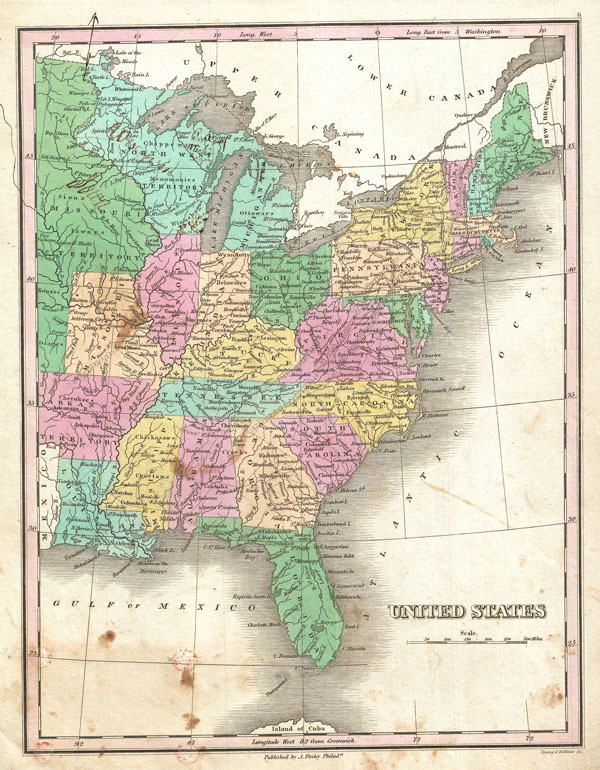 This is Finley's desirable 1827 map of the United States. Covers the United States as it existed in 1827, extending westward as far as the Missouri Territory, Arkansas Territory, and Mexico. Identifies rivers, mountain ranges, lakes, and major cities. Color coded according to states and territories. Virginia and West Virginia have yet to split. Texas is part of Mexico. The Arkansas and Missouri Territories extend westward off the map. Some pen annotations regarding the creation of Wisconsin and Iowa have been added by the original owner in the upper left quadrant. Names Numerous American Indian Nations throughout. Mile scale and title in the lower right quadrant. Engraved by Young and Delleker for the 1827 edition of Anthony Finley's General Atlas. Good. Minor discolorations to lower quadrants - see image. Pen annotations in the upper left quadrant. Rumsey 0285.006 (1831 edition). Phillips (Atlases) 4314, 760, 752, 6045.